The Flagstaff County skills day starts here in a town with medieval names. And there, not far from the corner of Galahad and Guinevere, is Sir Galahad himself, nobly standing guard over rail lines and graineries. But why is he locked up behind a wire mesh fence? Katrina Smith manages the Galahad Health Centre. There are 20 long term care beds here. and today she is touring 55 post-secondary healthcare students from Calgary. Katrina worked in Calgary for 10 years as an RN but left to practise, and start a family in rural Alberta. “Best decision I ever made. Coming out here from a work perspective, it gives me the opportunity to expand my scope as a nurse. Now managing, but I had a chance to work long term care, acute care, emerg,” says Katrina Smith, Care Manager, Galahad Health Centre. 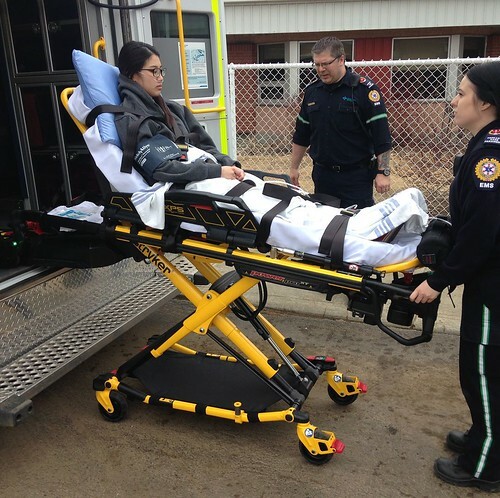 Next, paramedics simulate the rescue of a stroke patient, in this case played by a healthy student. Advanced care paramedic Gordon Stevenson, based in nearby Forestburg, loves the challenges of working rurally. Back on the bus and northbound to Killam, a community of roughly 1000 people that serves a large farming community. The rest of this skills day will be held here at the Killam Healthcare Centre. Unique to this event, is a dementia simulation. Half the students play the role of a dementia patient while the others observe. Then they switch. The goal? Geri Clark, site administrator at the Killam Health Centre, played a large part in organizing the day. She’s hopeful that some of the students will return here someday. Dr. Sam Ogbeide led the ultrasound station. He later spoke to the students at the dinner. They also heard from a physiotherapist who didn’t know anyone when she first came here from Toronto. The students toured a couple of the bigger employers in the area. Battle River Implements has a farm equipment inventory of over 40 Million dollars. On the way back to Calgary, a stop at Atco’s Battle River Generating Station. About a hundred people work here and supply power to 300,000 homes. Then it’s homeward bound with a better idea of what rural practice and lifestyle are like in Flagstaff County.